Landscaping isn’t just about planning and ensuring that all the required features are placed properly in the outdoor areas of your home. It’s about being creative and using various elements in such a way that they enhance the appeal of your home and entire property as well. This is why we as landscapers also take a lot of care while designing and decorative features, fire features, and water features. 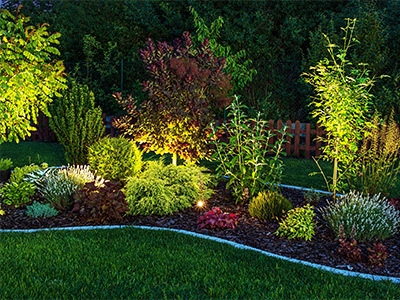 While all these elements add to the aesthetics of the landscape, the only way their beauty can be enjoyed even after dark is to make sure that your landscape has the right kind of lighting. We know exactly how important outdoor lighting is and as a full-service landscaping company, this becomes one of the aspects we focus on in every landscaping project we handle. We at Emerald Creek Landscapes, LLC are a well-established company in the landscaping field and have been serving customers in Ringgold, East Brainerd, and Fort Oglethorpe. Our experts have successfully completed a large number of hardscape design and installation projects across East Ridge, Dalton, Chattanooga and Red Bank as well. We have also catered to customers in Middle Valley, Cleveland, Soddy-Daisy, Calhoun and the surrounding areas and created beautiful lighting effects on their properties. The outdoor spaces of a home are used in the daytime, but it’s more common for people to use these in the evening hours to spend time with family and friends. The patio, deck or lawn spaces become the perfect area to entertain guests and have BBQ parties. But this will be possible only if you have well-planned lighting in your yard. Not only does the right type of lighting add to the beauty of the yard, but increases its security and safety as well. We can handle outdoor lighting design and installation jobs as part of full-scale landscaping jobs or as standalone projects. If you feel that the illumination in the outdoor areas of your property is inadequate or that it needs an upgrade, simply give us a call. We can provide custom landscape lighting solutions that meet your needs and fit into your budget. With the vast experience and expertise we have developed over the years, we know what it takes to provide excellent solutions at very competitive landscape lighting cost. For any more information on our services or to discuss your project details, feel free to call Emerald Creek Landscapes, LLC at 423-593-5443. You can also send us your queries and project details via this online form.